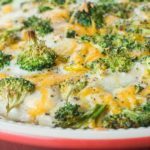 Cheesy Scalloped Potatoes Recipe - My Grandma's Creamy Casserole! I made these Cheesy Scalloped Potatoes with Grandma in mind because she would always make the most creamy potato casserole! It’s creamy, cheesy and uses my childhood favorite Cream of Mushroom Soup! 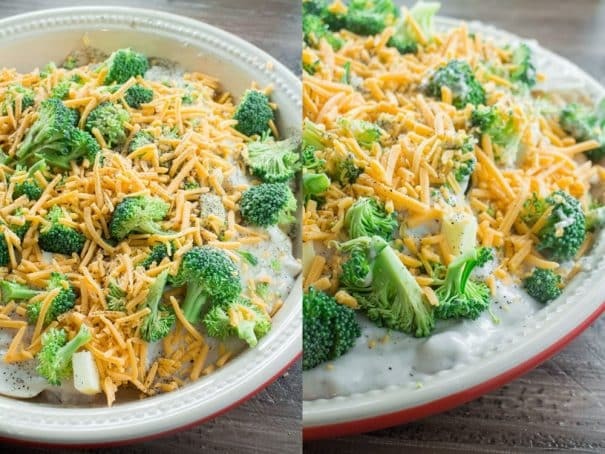 Besides the creamy soup to make it special, she would always add broccoli on top. 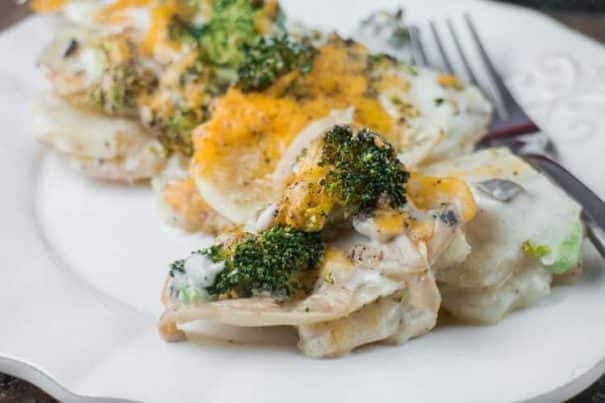 If you need to find a way to make someone eat their broccoli, add it with Cheesy Scalloped Potatoes – now they’ll eat it! Instead of using all that milk and a bunch of cheese this recipe is calls for Condensed Cream of Mushroom soup. I use Campbell’s but you can use any brand you want. You probably already have a can in your pantry for other favorite Thanksgiving side dishes but did you know it makes one heck of a potato dish too? This is one of my favorite Condensed soups to have on hand because it’s flavorful and saves me a bunch of time when I’m making multiple dishes at once. You’ll want to slice up 2.5 pounds of potatoes. I throw these into my food processor and they’re done within a minute. I always think it’s magic. Then you’ll want to cut up a head of broccoli. Use the reference photo below to the left to see the size of the broccoli cut up, each piece should be small. Then start layering all the ingredients into your casserole dish. Do one layer and then do one more layer and it’s ready for the oven. And once your hour and 15 minutes are up you’ll have a bubbling Scalloped Potatoes dish ready for serving. I hope you like this Scalloped Potatoes recipe and it helps you create a yummy dish your entire family will love! If you try this Cheesy Scalloped Potatoes recipe, please leave a comment or share it on Instagram with tag #brooklynfarmgirl – I’m always looking for photos to feature and share! Looking for more potato recipes? Try my Dairy Free Mashed Potatoes and Sweet Potato Soup! Cheesy Scalloped Potatoes Recipe just like my grandma used to make! They're so creamy because it's made with Cream of Mushroom Soup! My family declares this their favorite homemade cheesy casserole! 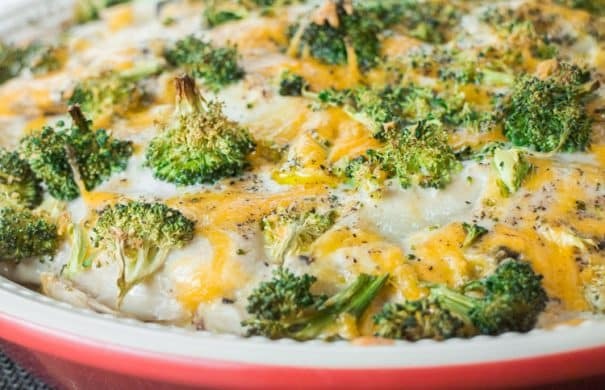 Warm up to this baked classic meal sometime soon! Love your use of cream of mushroom soup instead of dairy, Pamela! And – yay for your 1st vegetarian Thanksgiving! I grew up eating many cans of Campbell soup and have fond memories. I agree about Thanksgiving and the sides. Vegetarian is a great way to go and I am totally with you. Me too Monica, tomato soup was one of my favorites and still is. In fact I think it’s going to be a tomato lunch on this muggy afternoon. I better stock up for Winter! Hi Pamela, the sides are my favorite too, love that you added broccoli o this dish. Thanks Cheri, broccoli always makes everything better! 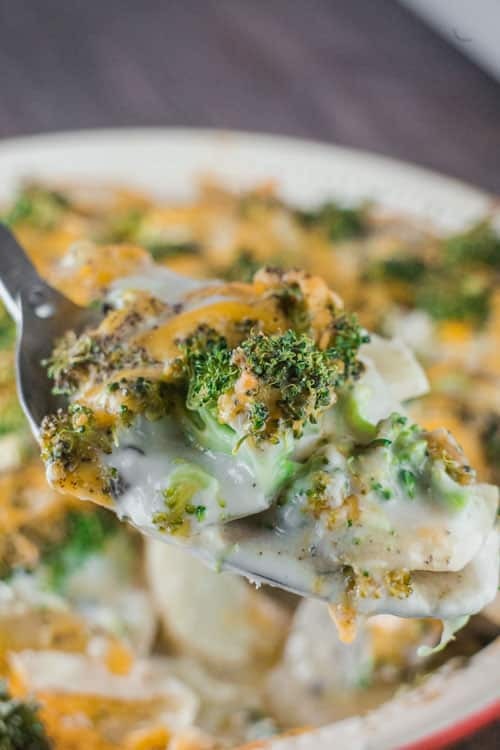 I am a frozen broccoli advocate, ’cause it’s always ready to use and can hang out patiently in my freezer until a recipe like this comes to my attention. Remember the moisture content is higher when frozen, so i recommend you thaw and blanche it in a small amount of water in the microwave. Let it cool, then wring it out with your hands to eliminate all the extra water. Then chop it up small as instructed. If you take this extra step, it shouldn’t compromise the density of the recipe. Oh yum, Pamela! This looks absolutely fantastic! All of my favourite things are in this dish. 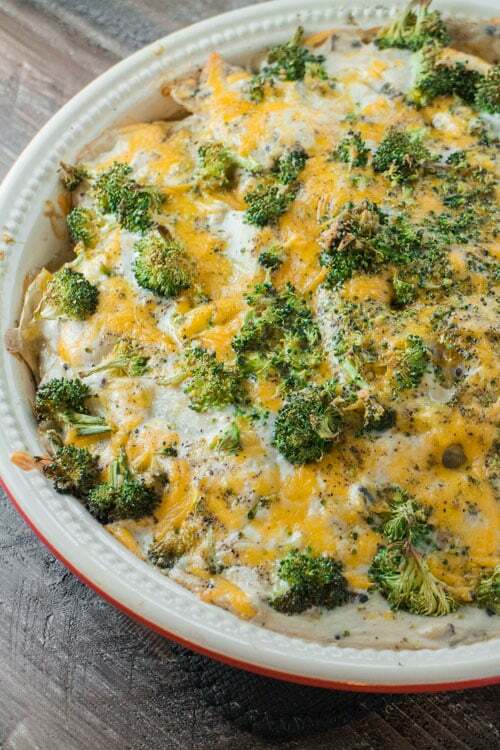 I love potatoes, broccoli and cheese together. I love campbell’s mushroom soup too – there is so much that you can do with it. I totally agree Dannii, I can’t wait to make more ooey gooey recipes with it! I agree, side dishes are my favorite as well! Pretty sure I could do Thanksgiving without the turkey. I’m loving this dish though… you make broccoli look incredibly delicious! High 5 to side dishes Heather! Oh my goodness…I’m pretty sure you just sealed the deal that THESE are the only way I’m going to want to eat potatoes now! All that cheesy broccoli goodness is KILLING me, Pamela! Don’t you love cheesy broccoli goodness?! Thanks Sarah! This meal looks so warm, and comforting. Perfect for chilly days! I love broccoli dishes! Oh yum! This looks and sounds so tasty! That looks so good and easy to make!! I know my family would love it!! Oh, I’m so hungry now! This is such a perfect comfort meal for weeknights! I’m going to make this with leftover turkey from Thanksgiving! I want a bite! That looks amazing. I love using Campell’s sounds in recipes. They are such a handy way to throw together a delicious meal. Wow – these look incredible! The ultimate comfort food. I can’t wait to try them! I always love sneaking broccoli into unexpected places. I’d have never thought to put it into scalloped potatoes, nor would I have thought to use cream of mushroom soup! Fantastic ideas – this is a must-try. I’ve been looking for new ways to incorporate veggies into our dinners AND some new Campbell’s recipes. This is perfect! Thank you for sharing! This looks delicious! I love cheese broccoli so this is a win in my book. That looks absolutely amazing. I’m a big fan of anything that includes potatoes and broccoli. That dish looks soooo good! I’m saving this for my hubby because he’s a total broccoli and potatoes fan! And your pictures are beautiful! This looks sooo good! I’ll have to try it this week! this looks so good! I need to try it out. That looks so good! reminds me of my grandma too. She always made scalloped potatoes, but never quite this fancy. I am not a fan of broccoli but the picture actually makes it look good. I might try the recipe without the green stuff though, I love cream of mushroom soup and potatoes. Thanks. That look so yum! Definitely trying it out. I will eat just about anything with potatoes in it and I love the creaminess of your recipe. This looks so good! I love cooking with broccoli. My kids don’t like it so much but I bet they would eat it mixed in with all of this creamy goodness! 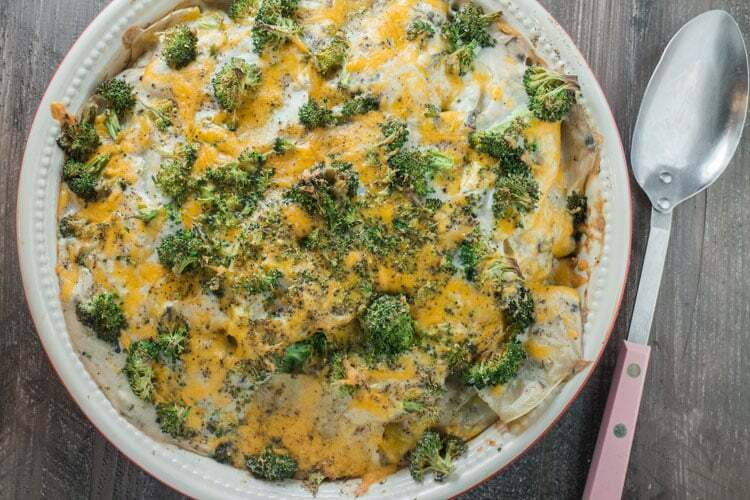 You had me at potatoes…this looks amazing and creamy! I don’t use cream of mushroom soup because doesn’t have enough flavor, I use cream of celery much better. Oh my goodness. This is the most fantastic recipe ever. So easy to make. Thanks. Glad you enjoyed Eva! Thanks for stopping by! Hey Sandy, thanks for letting me know you enjoyed this dish. Making it with coconut milk sounds delicious! Hi, I live alone and would like to make this. Can I just cut everything in half? If , what would be the time and temp? Hey Jarred, you sure can, just half all the ingredients and cook at same time and temperature. Enjoy. Thank you for the prompt response. I’m starving! Would it work with water instead of milk. Hey Vickie, it will def work with water, it just might not be as creamy. Enjoy! I am not really fond of cooking with Campbells soups because of the salt content. I will make this dish with almond milk and canned coconut milk though!! Just made this with almond milk and cauliflower (we were out of broccoli). Very good! 20 Scalloped Potato Recipes for the Easiest, Cheesiest Thanksgiving Side. Load up your plate with a heaping helping of this side.